I planned to spend time this evening visiting your blogs and posting a long post of my 2015 so far. Instead there is much tooth gnashing as I undo 9 billion knots and lament the potential of going out of the FA cup. Don't ask how it happened. The knots not the football. Normal service to be resumed shortly, meanwhile enjoy a picture of my knee and my very cosy slippers. Yes, I have been there, several times recently. Dog is all I am saying. I hope you managed to wind the ball up again, it looks like a nice yarn. Oh, dear. I understand. 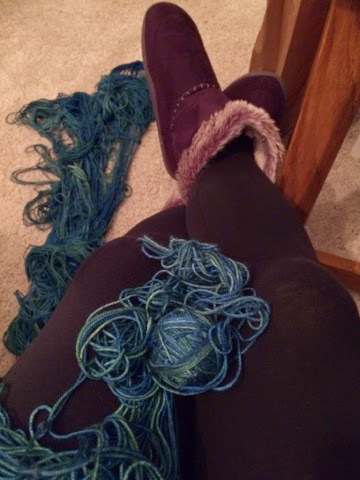 Sometimes I end up on the verge of tears with a knotted ball of yarn. It's no fun. I hope you got through it okay. In this house that would be the work of a whippet, usually the one called Finn! 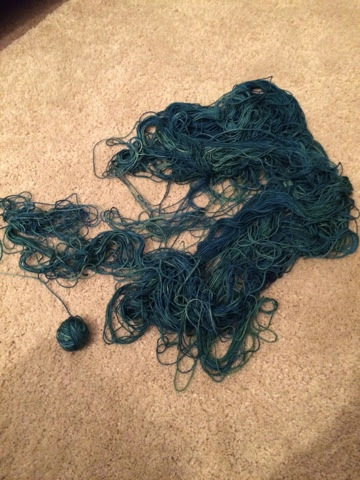 Good luck with the unknotting. That looks similar to my one and only attempt at crochet.